In the next 3 months, I will be preparing to move from my current home into a new house. It is a very exciting and yet stressful time. I have been making lists of projects that I need to do, things I need to pack and the best way to get them all accomplished while still working full time and taking care of kids. I’ve lived in my current house for 10 years and we have accumulated a lot of stuff. Not only do we have a lot of stuff, but we also have a ton of memories. Sometimes I think that the memories my kids and I have had in our home will be harder to leave than packing up 10 years full of boxes. I’ve been working hard to get my kids excited about our transition. We currently live on a busy road. We are moving into a neighborhood with sidewalks where kids play outside all day long! There are a ton of things to look forward to as we make this transition. But I also know there are lots of things that we will worry about. I try to be very open with my kids about the changes and I ask for their input before we pack a box or throw something away. Even though I have shared all of these exciting things with the kids and attempted to include them in the process, I still notice behaviors from them like fighting or whining or just looks of worry when the subject of the move comes up. Knowing that transition is hard for all of us, I wonder, how do you help prepare your children for the transitions that happen at your early childhood program? 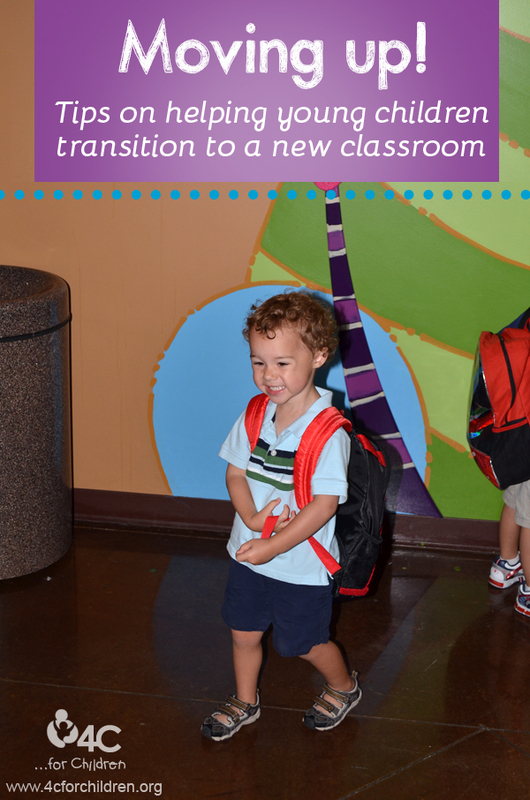 Do you have a group of children preparing to go to kindergarten? Do you have older infants who are about ready to move to the toddler room? What kinds of intentional activities will you do to support them as they get ready to move from one place to another? The new domain in the 5-Star Step Up To Quality system is called Family and Community Partnerships. It has a sub domain labeled Transitions. It asks us to think about how we will intentionally prepare children and their families to successfully navigate the changes that will occur. On page 44 of the SUTQ Guidance Document, it lists several activities that you may do to support your children during those larger transitions that occur. Take time to read that list and see what you can add to it. If there’s something missing from that list that you already do, add to it to the list and share with your co-workers. Talk with your children about the exciting changes that are going to occur as they get bigger and ready to handle new adventures. And when children show you that they are sad or worried about their move, have 2 boxes ready for them pack; one box to put all of their special memories and things from your classroom that they will take with them and one box ready to collect all their new adventures as they move on to their new space. Because there’s always room for more one more box, especially to be filled with new adventures good memories. This entry was posted in Best Practice, Infants and Toddlers, Preschool and tagged moving classrooms, transition on May 14, 2014 by angiegood.